Yesterday, I decided that I would bake my new husband (it sounds good to say it and to type it!) his favorite cookies. It also helped that the temperature here in Florida is in the 50’s and inside our house it feels like in the 30’s and the heater was NOT DOING IT’S JOB – so cracking up the oven sounded like the solution to warm up the house – and Chocolate Chip cookies was the reward. I been making these cookies for over 20 years – I don’t even think I’m following the original recipe at all anymore because I switch it up every time I make them - sometimes I put more coconut, or more rum. Others I up the chocoloate chips and the walnuts. But, I love them, the coconut, and the rum gives it that extra punch. Sort of like going on a virtual honeymoon to a tropical island with every bite. Something that right now Tom and I are thankful we can do. Preheat oven to 375°F. prepare 2 baking sheet and cover with silpat. Tip: I usually place my baking sheets in the freezer in order to have them nice and cold. Sift the flour, salt, and baking soda together in a bowl and set aside. In another bowl, using an electric mixer, beat the butter with the brown and white sugars until light and fluffy. Add the egg, vanilla, and rum. Beat the mixture well. 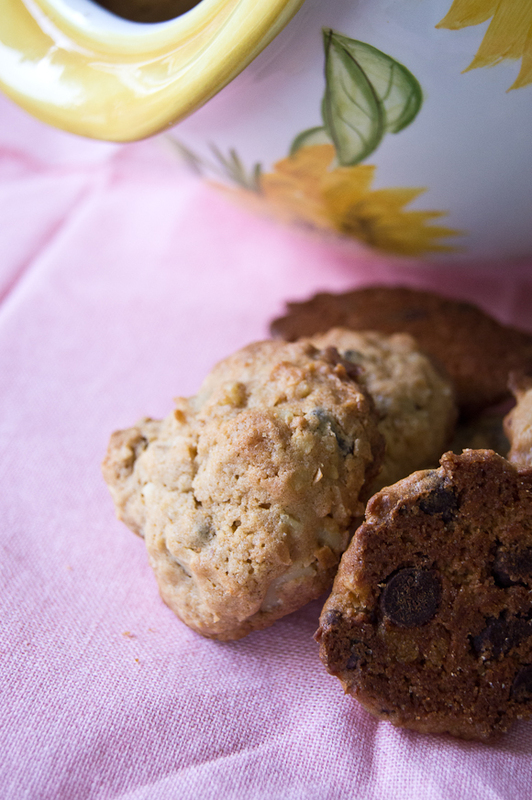 Fold in the flour mixture, coconut, chocolate chip and walnuts. Using a small ice cream scoop or spoon, form the cookies on the baking sheet, leaving about 2 inches between cookies. Bake for about 8-10 minutes. When ready take out and remove them to a cooling wire rack to prevent further baking. TIP: if you want to be extra lazy, I have even used the store bought cookie mix and then just add the coconut, walnuts and rum to it and they come out just as good.